At the beginning of July, on what seemed to be the hottest evening of the year, I was delighted to host a reception at the Gallery in collaboration with Bulgari. 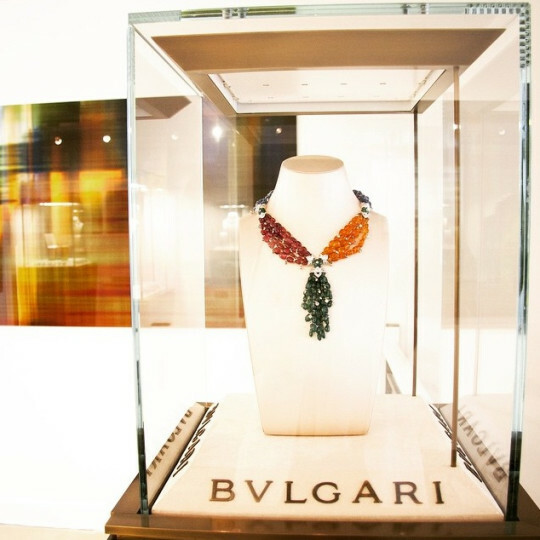 To coincide with the end of Christoffer Joergensen's exhibition, Bulgari brought items from their new fine jewellery collection 'Giardini Italiani' to showcase alongside Joergensen's work. We called the evening Green Masterpieces with the intention of combining art and jewellery under the theme of nature. The Bulgari piece I am standing next to here contains 1 square emerald cut diamond, 122 beads of sapphire, 46 beads of garnet, 47 beads of rubellite, 86 beads of emerald, alongside round brilliant cut diamonds and trapezoidal step-cut diamonds - a truly beautiful work of art. Behind this you can see part of Joergensen's Autumn, a computer-manipulated work which formed part of his recent exhibition, Take me There.